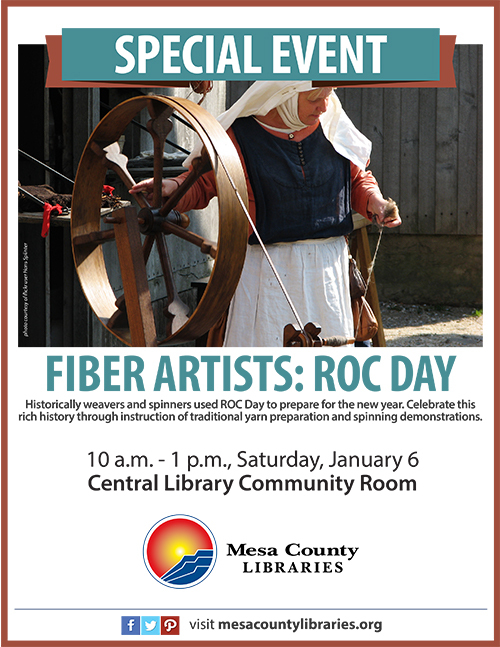 If you’re a fan of yarn, cloth, and fiber arts, don’t miss ROC Day from 10 a.m.-1 p.m. Saturday, Jan. 6, 2018, at the Central Library, 443 N. 6th St. in Grand Junction. Historically, ROC Day is a centuries-old celebration by European weavers and spinners who returned to work after the 12 days of Christmas holiday. On ROC Day, weavers and spinners cleaned and oiled their tools, organized their yarns and patterns, and generally prepared a rigorous schedule of making cloth for all levels of society. ROC Day is open to all interested persons at no charge. Posted in Crafts and Hobbies, General, Library News, Programs/Classes.